Last week, we invited a group of public relations and social media professionals to Google Austin to introduce them to the range of features offered as part of Google Places. Most of the attendees were experts on the basics (for instance, claiming a Place page), but many were surprised to learn about the other ways Google Places can help them connect with their customers. Customers can rate and review the places they go through Google, offering valuable feedback about what they liked and didn’t like about their experience. This information appears on the Place page for a business. Business owners also have the ability to respond to those reviews publicly — a great way to engage with customers and show you’re listening to their feedback. Once you claim your Place page and you’re logged in, you’ll see the option to respond to individual reviews. Restaurants could rate and review local farms, farmers markets, and artisans to show that they are using local ingredients. Hotels could rate and review local attractions that may be of interest to their guests, or use their profile to provide their concierge with a “cheat sheet” of useful info. Gyms could rate and review local restaurants to point out the healthiest menu items for their members so that they can reach their fitness goals. These were just some of the many ideas that were shared! The most talked-about topic of the night was the Google Places Business Kit, a box of info and schwag that business owners can request, detailing how they can better interact with their customers on Google. Some of the items a business owner can request include after-dinner mints and Place pin–shaped coffee stirrers, to remind and encourage customers to rate and review that business on Google. What are some of the ways you’re using Google Places to connect with your customers? Learn more by visiting our Google Places Help Center. Every business starts out small—whether with an idea or the hanging of a shingle outside an office or storefront. Even Google was once a small business, operating out of a garage in Menlo Park, Calif. We’re proud of our success, but we’re even more proud of the role we’ve played helping a lot of other businesses grow. In fact, in 2009 Google search and advertising tools generated $54 billion of economic activity in the United States. To further help new American businesses create economic growth, today we’re announcing a commitment of up to $100 million to the Startup America Partnership—an alliance of the country's most innovative entrepreneurs, corporations, foundations and other private sector leaders—for companies to promote their business with Google advertising over the next year. Startup America participants will be able to use Google advertising platforms like AdWords and Boost and receive a $1,000 Google match for $1,000 spent between June 1, 2011 and June 1, 2012. Our chief economist Hal Varian has calculated that businesses make an average of $2 in revenue for every $1 they spend on AdWords, so we think this commitment will be especially powerful. As users increasingly rely on tools like Google Maps and Places for information about the world around them, we're working hard to develop products that help local businesses highlight themselves and their offerings. Last year, we introduced our trial for Google Tags, a way for businesses to highlight their organic Google Places listing with a yellow tag that showcases offers, photos, videos, menu, and reservations for a flat monthly fee. Since that experiment began, tens of thousands of businesses have used Tags to help potential customers make easier, more informed decisions when searching. Throughout this period, we monitored Tags closely to learn more about our users' business needs and how they used the product. We’ve made a decision to shift our efforts toward other present and future product offerings for local businesses, and will be discontinuing this trial. To that end, we’ve now halted new signups and will be working with existing participating businesses over the coming weeks to help them meet their marketing needs with other Google products where possible. We’ve learned a lot from our Tags trial and will take that knowledge into account as we continue to find the best ways to serve users and local businesses alike. Lastly, we want to thank all of the businesses that were part of our Tags trial, and we hope we can meet their advertising needs with one of our existing products. If you've ever spent your Saturday calling different stores or driving around town in search of one specific product, then it probably occurred to you that there must be a better way. Today we're announcing Local Product Availability on Google Place Pages - a new feature that automatically brings your offline catalog to the web, letting customers view your products and search your local inventory on your Place Page before visiting your store. When you provide Google with local product availability data, your Google Place Page will now automatically include a new section, ‘Popular products available at this store’, featuring five popular products along with price and local availability. For shoppers unfamiliar with your business, this section shows the types of products available in your store. If shoppers are looking for a specific item, they can click ‘Search within this store’ to search your product inventory to see if a particular item is in stock nearby. To automatically display local product availability on your Google Place page, you’ll need to first share local availability data with Google through a Merchant Center account and claim your a Google Place page. For instructions on sharing local product availability with Google, read this Help Center article. Learn how to claim your Google Place page here. on March 15, 2011 at the JP Morgan Headquarters in New York City. Over 200 Ink small business customers attended the program, living proof of how an incredibly diverse array of small business touch our lives every day - from chocolate shops to online gaming and private medical practices. The evening featured welcome comments from Richard Quigley, President of Ink from Chase, expert advice from AdWords evangelist Frederick Vallaeys on four ways for SMBs to market their business online and also included the Nuyorican Poets Cafe’s executive director, Daniel Gallant, talking about how online advertising helped their business grow. Interested in learning more about how to get your business online? Check out our Small Business Online Marketing Handbook to get started. Every day we hear from business owners who think they need special skills to reach new customers online. Often they’re just overwhelmed by the seeming complexity of online marketing options. So they sit on the sidelines, eager to get in the game, but confused about where to start. Google and Ink from Chase have teamed up this year to help small business owners get off the sidelines and into the game! As part of this commitment to helping small business owners, we jointly hosted the first Google-Ink from Chase ‘Grow Your Business Online’ event on March 15, 2011 at the JP Morgan Headquarters in New York City. The world has gone mobile. From smartphones to tablets, mobile devices are quickly becoming the best way for people to find products and services when they're on the go. Read on to learn about how you can take advantage of the mobile opportunity with AdWords and drive mobile customers to your business. People on the phone are looking for immediate answers. So it makes sense that many smartphone consumers call the businesses that they find after a mobile search. Encourage new customers to call you with AdWords Click-to-Call, which displays your business' phone number as an additional line of text on your ad. Google research shows that click-to-call ads drive a 6-8% average increase in clickthrough rates. Make it easy to find you, too! If you're a local business, mobile users are especially important, because one out of three searches on a mobile devices has local intent. And, according to a recent survey conducted by eMarketer, 58% of smartphone owners say they use their phone to find store locations. In AdWords, you can use Location Extensions to display your business' address and its location on a map. Once you have Location Extensions enabled, you can automatically take advantage of the new Hyperlocal feature. Hyperlocal shows your potential customers distance information, so they can see how close they are to your store! The eMarketer study also shows that people commonly use their phones to compare prices, find discounts and check product availability. Consider writing ads especially for smartphone users, keeping in mind what people want when they're on the go. You can actually create a separate AdWords campaign just for mobile. Check out AdWords Insight, below, for detailed instructions on how to do that. ADVANCED TIP: What happens when someone wants to find out more about your business, and clicks to your website? Does your website load quickly enough for smartphone users? Take a few moments to see if your website passes the test. If it doesn't, there are a range of options to help you optimize your website for mobile devices. *Source: Meeker, Mary; Morgan Stanley. "Ten Questions Internet Execs Should Ask & Answer." Business Insider.com, November 16, 2010. Google Research shows that mobile-only campaigns help drive higher mobile clickthrough rates—11.5% higher on average. Why? With a separate mobile campaign, you can set the bids, budgets, keywords and ad text that work best for mobile customers. Create a new campaign in your AdWords account. Find the "Networks and devices" section in your Campaign Settings, and under "Devices" click "Let Me Choose". Un-select "Desktop and laptop computers," so you are only targeting "Mobile devices with full Internet browsers." Select keywords and create ad text with your mobile customer in mind. Learn more about the benefits of a mobile-only campaign. Can your customers find you when they need you most? Roy's Restaurants shared the success of their hyperlocal mobile-only campaign: "Mobile searchers looking for dining options could effortlessly see how close they were to a nearby Roy's restaurant and the click-to-call function allowed for instant reservations." This campaign drove a 40% increase in calls, while the cost-per-click was 67% less than desktop ads. As a result, the campaign's overall return on investment was 800%—double the ROI of their blended mobile/desktop campaigns. Want to try it for your business? Learn about the strategies Roy's used. Want to visit the world's most magnificent museums and masterpieces? 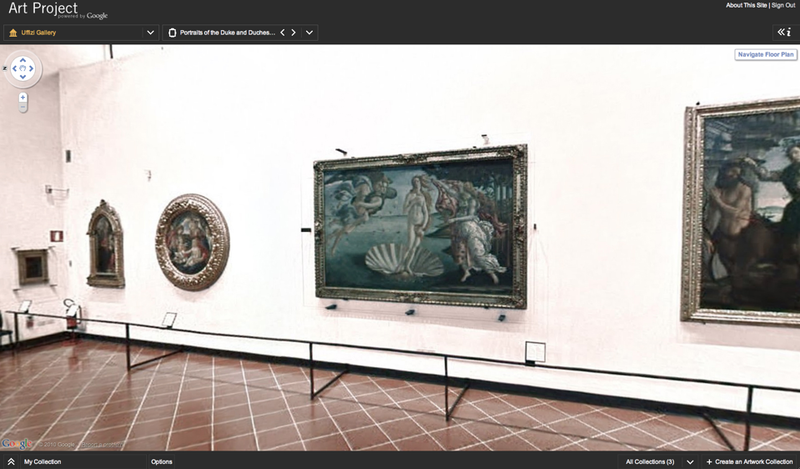 Art Project, powered by Google—collaboration with 17 of the word's most acclaimed museums—lets you walk through museum wings to explore the world's most precious works of art. From Van Gogh's Starry Night to Botticelli's Birth of Venus, zoom in to discover striking details like brushstrokes and aging signs, all without leaving home. We’ve worked hard to keep in touch with our AdWords customers and we’re always looking for new ways to support you. Currently we offer email and online support, and today we’re introducing free phone support for all of our U.S.- and Canada-based AdWords customers. When you have a question about your account or advertising campaigns, you can now call an AdWords specialist if you prefer. We’re adding phone support for a simple reason: you asked for it! You told us that while you appreciate online resources like our AdWords Help Center, you also want the option to get live, expert support when you need it. We heard you, and got to work assembling a team of AdWords experts to answer your calls. The new phone option is one of many tools that can help you succeed with AdWords—and (most importantly!) find even more customers. You can also email us, or learn from other advertisers in the AdWords Help Forum. Our AdWords Online Classroom offers free online courses on a wide variety of AdWords topics, from the basics to great tips to take your account to the next level. To speak to one of our specialists, give us a call at 1-866-2Google between Monday-Friday, 9am-8pm Eastern Time. This number is for current AdWords advertisers only, so please make sure you have your customer ID ready. We look forward to speaking to you and learning more about your business. We'll roll phone support out to advertisers in other countries in the coming months.